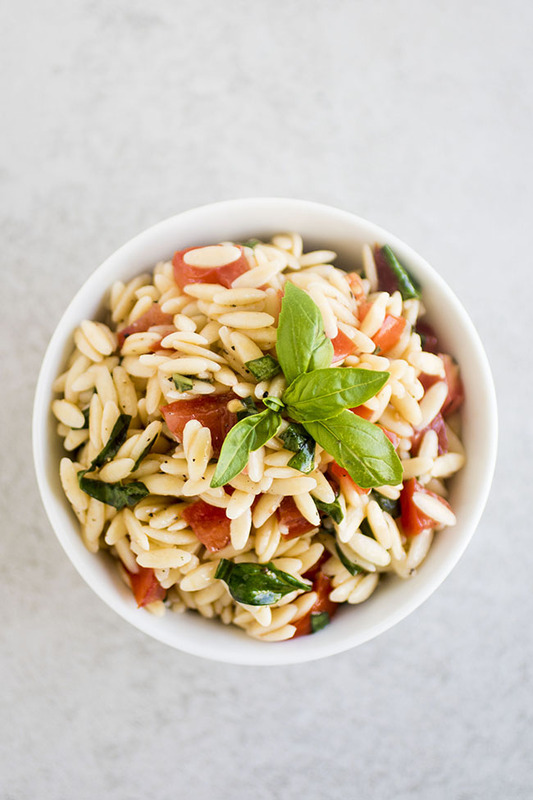 This simple orzo pasta salad recipe is perfect for summer picnics, potlucks, and barbecues! A great make ahead lemon pasta side dish that everyone will enjoy. In a hurry? Click here to jump straight to the recipe! I might be a teeeeeeeeensy bit obsessed with this lemon orzo pasta salad. For one, it’s insanely easy. We’re talking mayyyyybe fifteen minutes of prep time and just a handful of basic ingredients. 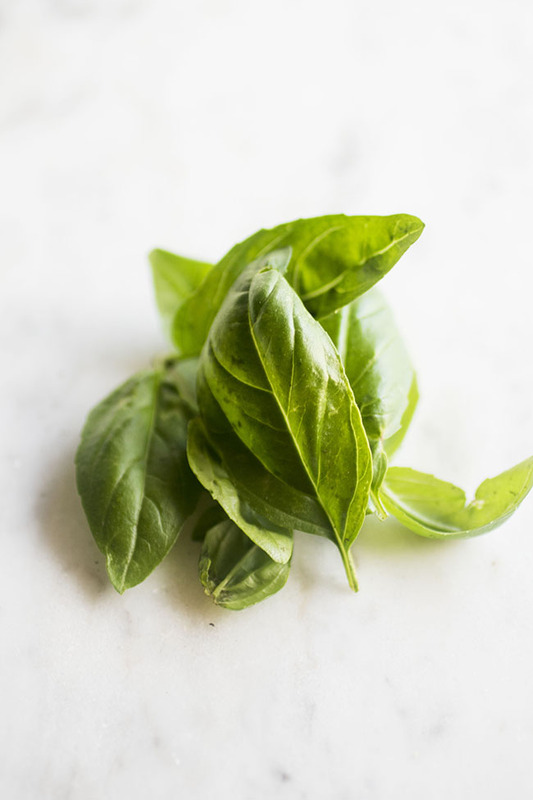 This basil is a pretty big deal, mostly because 1) I’m a chronic accidental plant-killer and 2) we live in a small apartment with no yard so everything is in little plant pots and 3) please see #1. Side note: If you are good at growing things, please drop me a comment and tell me your secrets. Because I am simultaneously super determined to keep my basil plant alive and super anxious that I am going to accidentally, you know, kill it. We’re also growing TOMATOES this year (and by “we” I mean Kyle who is the resident does-not-kill-all-the-plants-er), but they’re not quite ready to make their way into this orzo pasta salad yet. Kyle (HI KYLE) has three tomato plants in big ol’ buckets on our patio, and I’m attemptinnggggggg to grow basil (CHECK AND DONE, ⬆ SEE ORZO SALAD PHOTOS ⬇), parsley, and strawberries. We put the tomato seedlings in less than a month ago, and they’re already HUGE. I love checking on them every day – partly it’s fun to see how fast they grow, and partly because I work from home so walking downstairs to stare at a tomato plant is often the only time I leave the house all day (my job is super glamorous, you guys). 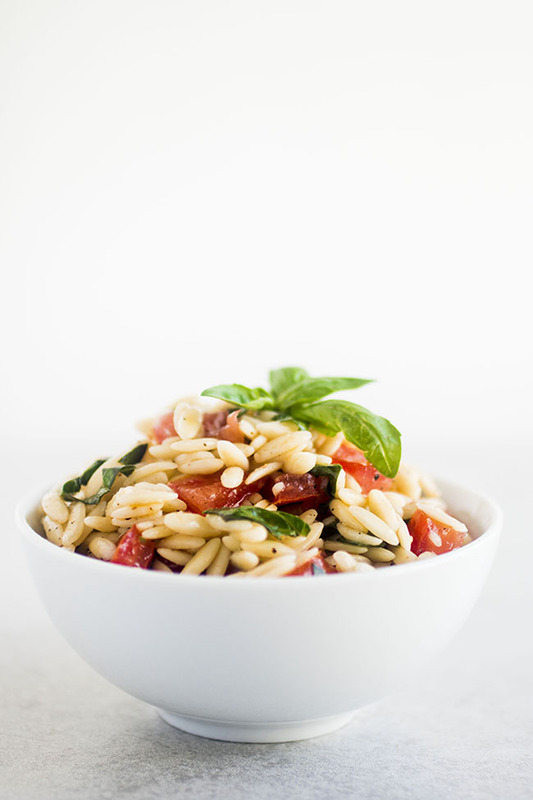 A tasty orzo pasta salad recipe perfect for summer potlucks. Use a microplane or small grater to zest your lemon. Place zest into a large mixing bowl. Cut zested lemon in half and squeeze all of the lemon juice into the mixing bowl with the lemon zest, being careful not to let any lemon seeds fall into the bowl. Add olive oil, salt, and pepper to lemon juice and whisk to combine. Set aside. Cook orzo in very salty water until al dente. Ladle out 1/2 cup of the orzo’s pasta water and set aside. 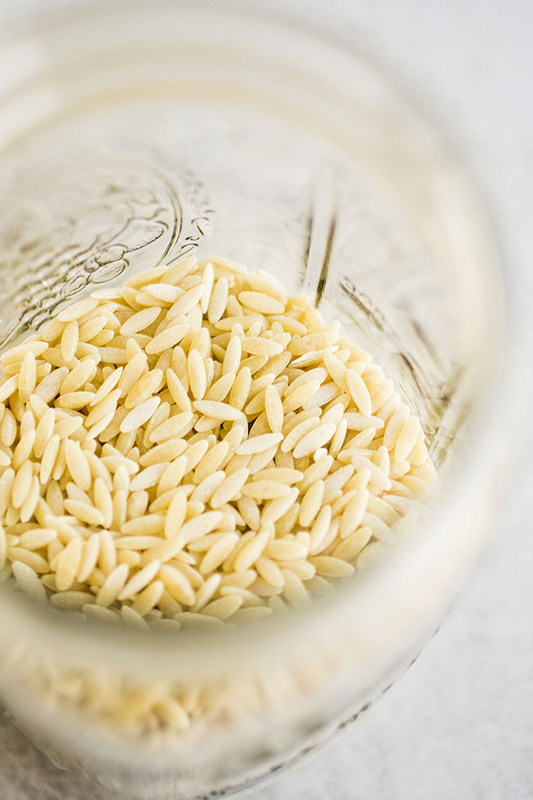 Drain orzo and add drained pasta to the lemon-olive oil mixture. Add the reserved pasta water to orzo and stir to combine. The sauce will look pretty watery, but don’t worry – the orzo will soak up the liquid as it cools. 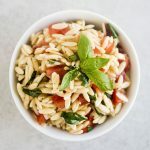 Let orzo cool in the mixing bowl for 10-20 minutes. 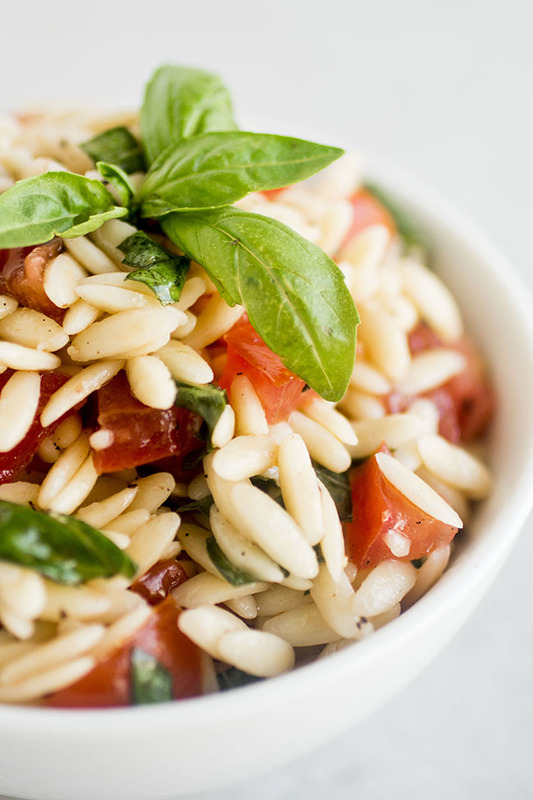 When orzo has cooled down, add the basil and tomatoes and stir to combine. Taste and add seasoning as necessary. 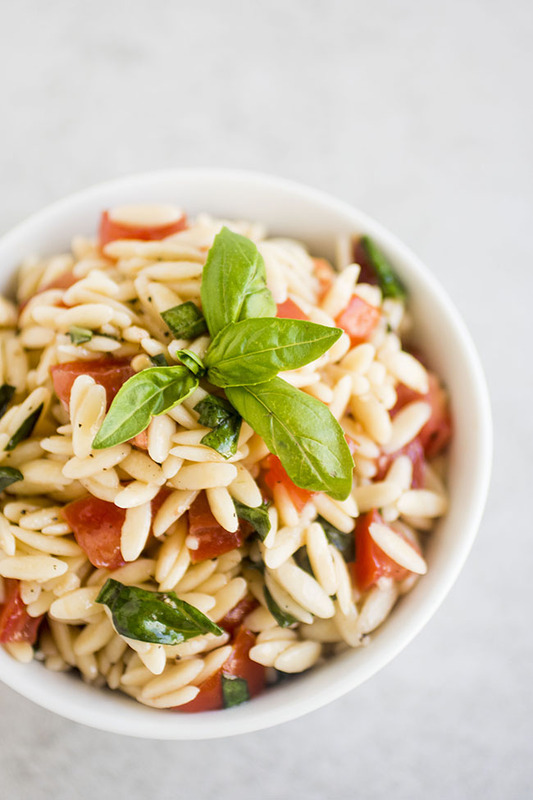 Transfer orzo to an airtight container and chill in the fridge for at least 2 hours or until ready to serve. This is a great dish to make ahead of time for summer picnics and potlucks! Use good quality olive oil for this recipe – there aren’t very many ingredients here, so using high-quality stuff is all the more important. Add additional herbs, grilled chicken, mozzarella cheese, or extra veggies to mix this salad up a bit and make it your own! If you don’t have a fresh lemon, you can substitute 1/4 cup of lemon juice in this recipe. Pairs well with Smoked Gouda Beer Burgers, summery Lemon Garlic Chicken, or your favorite veggie dish. Delicious! Added Mediterranean feta cheese, artichoke hearts & olives! Hello Maria, YUM sounds great! Still enjoying this recipe in early November, before is time to switch to cooked risotto. In place of basil, I used curly parsley 1/2 cup and dried mint 1 tsp. Very welcoming dish to try variations. Hi Paul, thanks so much for sharing! This is delicious, have added different things every time and the result is always delicious, its a go to for me at least once a week! Hey Jennifer, so great to hear we are in the dinner rotation! Thank you! I love this recipe because I can remember all the ingredients! It’s been my go-to so far this summer because of that alone. Now I’m getting requests for it! Yay!! I do stir in some feta once it’s cool…because FETA!! I hear ya girl! I’m obsessed with orzo and anything with lemon haha! Gorgeous and yummy! Love it!